For many homeowners, there’s no greater pleasure in the world to sit in front of a fireplace, experiencing the comforting ambiance that it produces on a cold winter day. The fireplace is one of the earliest heating innovations of mankind, existing for centuries as a place of comfort from those dreary winter nights. However, with the passage of time, modern fireplaces often mimic their older counterparts when aesthetics is concerned. There can be many reasons for this, almost all of which includes the nature of usage of the homeowner. Luckily there are some steps that you, as a homeowner can take in order to ensure you get the most heat out of your fireplace. A common problem revolves around controlling drafty open place fireplaces, which both defeats the purpose of a fireplace, as well as posing a threat to its surroundings. Open fireplaces do not always produce the desired results. They often falling short of providing the heat necessary for keeping the whole room warm. Generally, the efficiency of a fireplace increases if you follow some simple tips and practices. While using the damper, open it as wide as possible to increase the airflow into the fire. This naturally results in an improved combustion rate, which results in an increase of heat from the fireplace. However, more combustion means that your fireplace would use up wood faster. Adding glass doors to your open fireplace will help with the heat loss associated with open fireplaces. Once the fire starts dying down you can close the glass doors. This will restrict the chimney pulling room air up the chimney when you go to bed. Woodburning fireplaces provide the best results when used with seasoned, dry firewood. Seasoned wood of any kind is dry enough to create more heat than normal freshly cut or green wood. This is mainly because the heat from the wood is required to burn off the moisture. This is while wasting the heat that it could be generating. This can also increase the likelihood of creosote buildup in your chimney. Cleaning the chimney is one of the most essential parts of maintaining a working fireplace. Clean it at least once a year. This is because of the dense creosote buildup on inner walls of the chimney. Creosote blockages can result in restricted airflow which makes it very hard for the wood to burn efficiently. It also poses a fire hazard, as there have been cases in the past where an unclean chimney is to be blamed for a fire accident. The above tips can help you improve the heat generating capabilities of a wood burning fireplace. However not all fireplaces are the same and would produce different results. In many cases, it is advisable and feasible to modify and add a wood insert. Certain components into an already existing fireplace. These can include Firebacks, fire doors tubular grates and even fire inserts. Below are some examples. Many homeowners turn towards using tubular grates, a series of open pipes installed behind the fire. This extends all the way out of the firebox to any opening. They follow the principle of drawing in cool air from the atmosphere, heat it and direct it back. This is for more heat generation. Very few open fireplaces come with fireplace doors, but it can be the major difference between producing just a little warmth and producing heat enough for the room in question. Fireplace doors reduce the amount of air that would otherwise escape through the chimney. They are usually made of ceramic glass or tempered glass and fits well enough against the fireplace opening. Firebacks refer to a simple heavy sheet of metal, preferably cast iron, which is placed behind the fire. Besides providing protection to the inner walls of the fireplace, it also does a great job of reflecting significant amount of heat back into the room. Probably the most efficient solution on this list, a fireplace insert can do wonders for a wood burning. 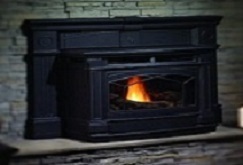 It acts almost like an extra wood stove that can fit into the existing fireplace. Fireplace inserts are probably the most energy efficient option available, reducing standby losses. Good fireplace inserts generally include a stainless steel liner, which runs right up to the top of the chimney. It should be noted that there are various laws and regulations that cover the use and installation of fireplace inserts. Legal approval is necessary. People may want to install a fireplace for a variety of reasons, ranging from aesthetics to functionality. In parts of the world that experience significant winters, a fireplace is an essential part of almost all households. The above tips will help you to make the required adjustments to improve the efficiency of your fireplace. However, purchase your fireplace and other related components like inserts, fire doors, etc. from a certified and reputable dealer. Today’s markets are filled with a myriad of options when choosing a fireplace. These are available from a host of different distributors. This makes it quite confusing to make a concrete decision because of the number of variables involved. Since you’ll be making a substantial investment for a fireplace, try a tried and tested, reputable distributor or dealer. The distributor should provide an extensive catalogue of options for you to choose from. As fireplace installations can differ among households. It is extremely important for the dealer to provide you with a range of options and components that best suit your preferences and needs. A quick market research will assist you in making a well-informed decision.